1. Tell us a little about the camp. Camp Invention is the only nationally recognized, non-profit elementary enrichment program backed by the National Inventors Hall of Fame. Over the past 40 years, and in partnership with the U.S. Patent and Trademark Office, our programs have encouraged nearly two million children, teachers, parents, college students and independent inventors to explore science, technology and their own innate creativity, inventiveness and entrepreneurial spirit. Our instructors are all local certified energetic teachers. Leadership interns are high school level children who have an interest in education, math or science. CIT’s are energetic and hands on, assisting in the modules. 2. What is your camp’s philosophy? At Camp Invention, our top priority is to provide quality programming in the fields of science, technology, engineering and mathematics. So our unrivaled program presents essential STEM concepts through the most creative hands-on activities. By combining learning and fun, we satisfy parents, educators and children, earning an approval rating of more than 90%. We strive to enhance each child’s ability to learn through teamwork and subject immersion while providing exciting challenges and cultivating a new appreciation for discovery. Children are free to discover their own ideas. There are no wrong answers as they explore their own curiosity. Collaborative learning is a part of every module throughout the day. 3. Can you briefly explain “A typical day for a camper” at your camp? Camp Invention runs for one action-packed week, Monday through Friday from 8:30 a.m. to 3:00 p.m. Each day, campers work in teams as they rotate between four fun thematic modules. Each module brings new challenges to build upon what was learned the previous day. Just imagine what your child could experience: • Collaborate to build prototypes, following the example of National Inventors Hall of Fame inductees. • Upcycle and re-engineer with gears and gadgets, developing critical-thinking skills and creativity. • Explore STEM (Science, Technology, Engineering and Math) enrichment, motivating a group to develop solutions to real-world problem. 4. What are the different activities that kids can enjoy at the camp? The 2015 program is themed “IlluminateTM.” The IlluminateTM curriculum features four energetic and fun-filled modules that incorporate Science, Technology, Engineering and Math (STEM) activities, which will empower your creative thinker and further inspire them to innovate and solve problems! 1. KartWheelTM Future engineers will love the opportunity to create a freestyle race kart that can withstand water and navigate the ultimate wet terrain obstacle course! With exposure to the world of physics through their participation in daily Hydrochallenges, such as Lever Launch and Super Sling, campers will collaborate with their team members to earn points and spend them in the Hardware Store on materials to upgrade their karts. Once their kart is complete, campers will put their STEM skills to the test in a grand finale race across the finish line to see who will be the fastest KartWheelTM racer! You can watch a video here. 2. I Can Invent: Next Level GamersTM No matter if your child is an avid video gamer or plays occasionally, they will love the opportunity to help the Camp Invention Gaming Labs come up with the next must-have video game called MazeWorld! Campers will have the opportunity to reverse engineer high tech-components of non-working devices such as upcycled and re-powered gears, motors, magnets and other gadgets to build their very own three-dimensional physical video game prototype that features a strategic maze and multiple levels! Students will collaborate with other team members to develop a storyline for their video game featuring characters including a superhero and a villain that will go on a quest to overcome obstacles developed by the campers. Once their video game prototype is patent-worthy and complete, the team will earn the title of “Next Level GamersTM.” Here is a video. 3. Design Studio Does your child like to build and design big ideas? Our Design Studio: IlluminateTM might be their favorite module yet! Children will be empowered to explore their creativity in our innovation laboratory, where they can design their own invention, investigate circuits or taking on a nature-inspired design challenge. As they dream, tinker and make discoveries, they will have a chance to invent a prototype from scratch and explore math from a new angle when they create origami flight models during team-building exercises. You can watch a video. 4. 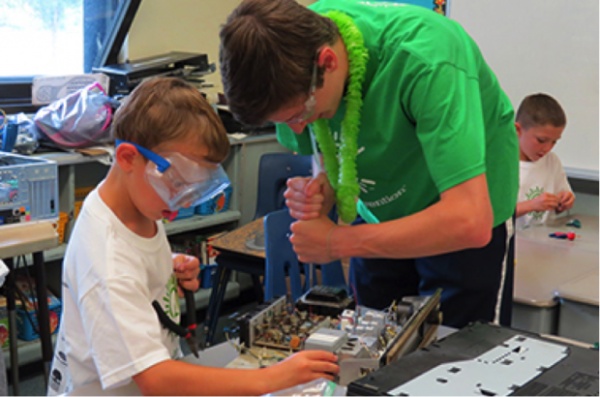 InductedTM World-renowned inventors have influenced Camp Invention’s curriculum for 25 years. The InductedTM module will introduce your child to innovation role models and give them a first-hand account of what it takes to make their mark on the world and get into the National Inventors Hall of Fame! During this module, your child will receive personalized messages from Inductees as well as an invention-based challenge from innovators who have revolutionized the world in various industries including medical advancements and digital music technology. As your child shoots for the stars with their very own creative solutions to an underwater archaeological challenge, you’ll be impressed with how their ideas on building a marine exploration vehicle will get them inducted into their very own hall of fame – the Camp Invention Hall of Fame! Check out the video! 5. Is there a camp curriculum that you follow with kids at/below a certain age? Each of the modules are modified for the younger ages, yet are still challenging for them. 6. Why should parents send their kids to your camp? • The quality of our staff–a group of certified energetic teachers who are used to teaching hands on discovery. • Your child’s imagination is limitless- they need a place to let it run wild! • By the end of one inspiring week, your child has gained confidence, friendships and essential 21st Century skills that will last a lifetime.